If you haven’t already heard, one of the things currently trending are destination weddings. Hello Italy, Mexico, and BVI! Finally more and more couples are catching on to this trend and it is no longer a concept for only elopements or second marriages. Destination weddings eliminate the politics of who should be on your guest list. We all have friends who have planned a hometown wedding where it just seems impossible to draw the line on who to invite. You have your distant cousins, your parents’ work colleagues, your social club connections, your high school friends who you casually keep up with on Facebook but haven’t really seen in years but couldn’t not invite… Before you know it, your list is way over where it should be creating a throbbing headache and mountains of stress. 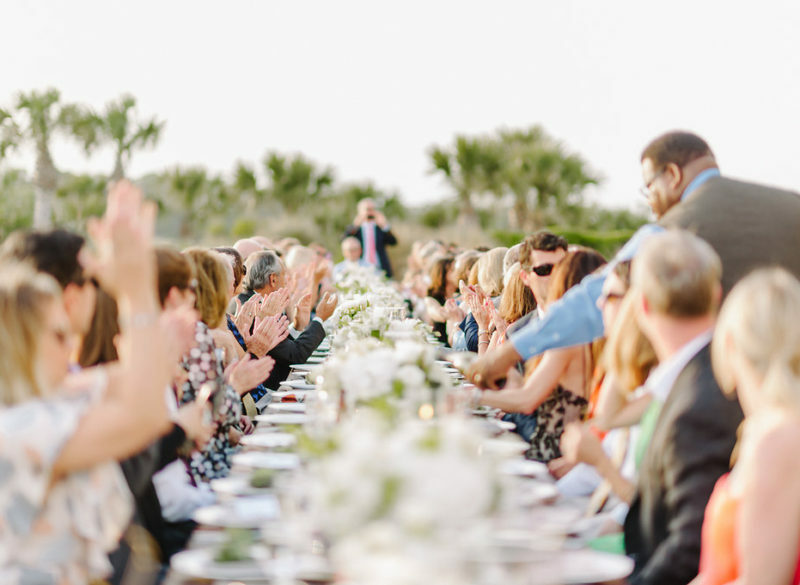 With destination weddings, you gain more control over your guest list. It is understood that only those closest to the couple are invited and, magically, the guilt of not including extended friendships on the guest list is gone and there tends to be no hard feelings in those who are not invited. What goes hand-in-hand with a smaller guest list? A more intimate occasion. For some couples, the hustle, bustle, and production of a big wedding can be distracting while for others it is a non-issue. If you find yourself being distracted but the thrill of a big wedding, remove yourself from the fuss and escape where you have the ability to focus on your marriage – and sometimes that means finding an exclusive destination to exchange vows. Everyone is different and never losing site of why you are getting married is the most important key to any successful marriage. As a planner, I do everything I can to support my couples in maintaining that focus no matter how much or how little production goes into the day. Speaking of focus, what a better way to absorb in the magnitude of your upcoming marriage than traveling to a beautiful destination to relax, unplug, and unwind in the days leading up to the big day? Disconnect by arriving to your destination earlier the week of your wedding. Allow yourselves some quiet time together and consider making plans for some down time with your parents as well. I always encourage my couples to schedule at least a dinner with immediate family the week of the wedding because once the wedding festivities begin, you all will be swept away with your guests and your attention will be elsewhere. Savor this special time and make a point to spend some of it with your family. Another reason why couples are so drawn to destination weddings is that they want to do something different – not the same old country club wedding that 15 of their friends have already had. More and more couples are viewing weddings as not just a celebration but a statement of who they are. It is much bigger than a party, it is an experience and a personal expression – and there’s no better way to provide an experience for your guests than by inviting them to travel with you. As a destination wedding planner, I serve as the concierge to my couples, their families, and their guests. I work closely with my clients to curate an experience their guests will never forget. The planning goes beyond just creating a beautiful event, it is about ensuring that guest traveling is easy, that their arrivals and departures are seamless, that they are equipped with all of the information they need to explore the destination and make the most of their stay. They are offered the best recommendations on where to eat and which sites to see and are given intentional down time away from wedding events to enjoy a little escape of their own. My goal is to leave no question unanswered and allow your guests to feel just as cared for as if it were they who were getting married. Last but not least, how incredible would it be to wake up the morning after your wedding and find yourself already on your honeymoon without having to get out of bed and onto an airplane? Don’t wake up from the destination dream that you’re already in, stay there awhile. Worried about privacy from your family and guests? Book accommodations away from where your guests are hubbed and achieve the seclusion and alone time you deserve. Need any more convincing? I could keep going! If you’re toying with the idea, I’ll give you a nudge. It’s not as difficult as it seems and, with a good planner at the helm, it can be an experience of a lifetime for you and your guests.